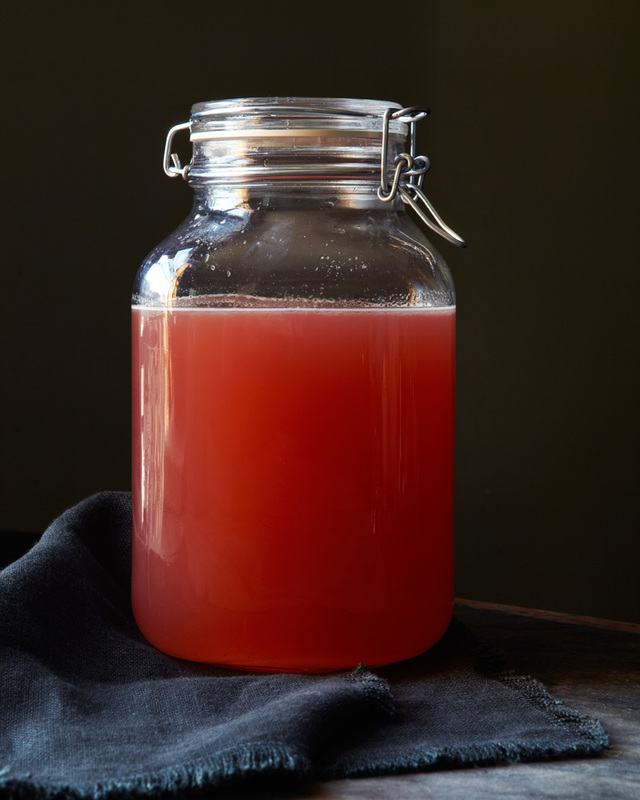 rhubarb shrub and other musings. I am a bit of a Rhubarb fool. I tend to go crazy for this plant when it first appears in the late days of spring. I mark many of my internal calendars by the first sightings of plants, a by-product of growing up in the country and living by an agricultural calendar. Now, as a city dweller, I rely on the farmer’s markets or trips upstate for these visual cues. For me, wild strawberries hark the last days of school, lily of the valley marks May Day, violets, mothers day, and rhubarb the hot imminent approach of endless summer. These days with time literally flying by and working in an industry that is always months ahead of itself, I try to savor every one of those moments when they come. 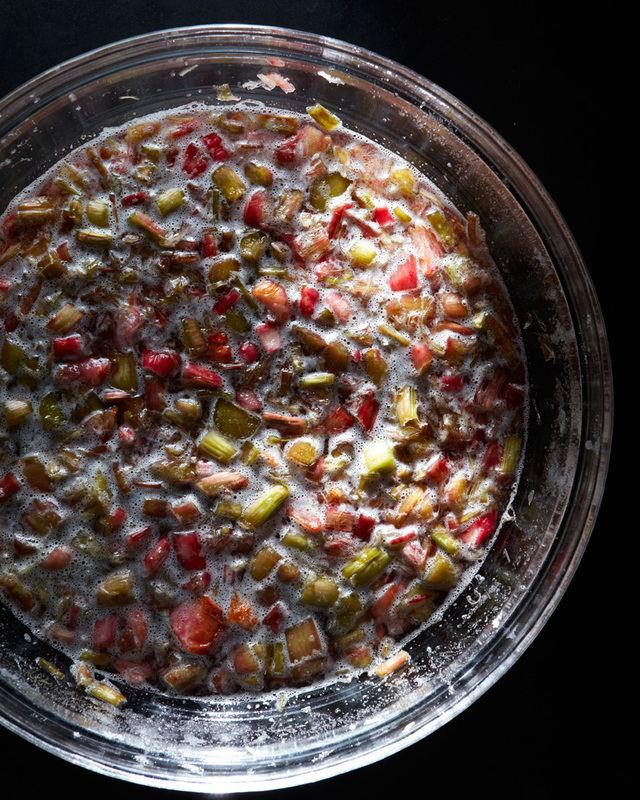 This past week, while shooting the Four and Twenty Blackbirds book, we came across some amazing rhubarb given to the pie shop by a farmer from upstate New York. At the end of the day I was more than happy to take some rhubarb home and cull a post that has been brewing in my mind for days! I first turn to Nigel Slater’s amazing Tender Volume Two. He offers a great synopsis of rhubarb; ”It was the darling of the Victorian kitchen, finding it’s way into pies, fools, crumbles and tarts quite by chance.” Rhubarb, according to Nigel Slater, had been used medicinally since 2700 BC. The British apothecaries grew tired of paying high prices to the Chinese importers and decided they could import plants and grow their own. Unfortunately, they imported a less potent strain of the plant which turned out to not be as successful for medicine but a more edible version. So this is how, more or less, it came to be in British kitchens. A month or so ago when Back Forty West first opened in my neighborhood in the old Savoy they had a great cocktail on the menu called “Surrender Dorothy”. It was some version of Dorothy Parker Gin and pomegranite shrub. It quickly disappeared, and being a gin lover I was somewhat disappointed when they told me that they could no longer make it because they were out of the shrub and would not have anymore until pomegranites appeared again in the market. Now that rhubarb is in season I have decided to make some of shrub of my own! Different than a fruit syrup, a shrub or drinking vinegar is concentrated syrup made from ripe fruit, sugar and vinegar. I came across many different shrub recipes on line and in old cookbooks. Some were a hot process shrub and some were for a cold process shrub. I decided to try the cold process as it makes for a brighter flavor. There were also a plethora of conflicting ideas on the amount of sugar to fruit. I decided to go for equal parts sugar, fruit and vinegar for the simple reason that it would be easy to commit to memory. Shrubs take some time to make as the fruit needs to macerate and then rest for a few days before straining and adding the vinegar. I best get on with it if I want to be sipping an adapted version of Surrender Dorothy by week’s end! Combine the sugar and the fruit in a large non-reactive (preferably glass) bowl. Mash or muddle the fruit a bit with a pestle to get it started macerating. Cover and set aside on a counter out of the sun for 24-72 hours. Strain the fruit from the liquid with a fine mesh or cheese cloth. (I did mine in two batches.) Now here is the tricky part... I have read different accounts on this next step. You can add the vinegar to the fruit after 72 hours and let the fruit and the vinegar and the sugary syrup mellow all together for a week out of the refridgerator covered before straining, or you can strain the fruit from the sugary syrup at this point. I chose the latter, to strain the fruit and discard it after 72 hours. I then measured my sugary rhubarb liquid and added an equal and matching amount of vinegar. I poured this into a clean jar and set it tightly sealed in my pantry to mellow and age for a week. After a week I tasted it and it was both tart and sweet with a bright rhubarb note, though it smells strongly of vinegar. At this point I put it in the refridgerator for long term storage. There is a great article on the history of shrubs both hot and cold process here on Serious Eats. It seems everyone from bloggers to The Old Joy of Cooking make it a little differently. I think it is all about experimentation. I used apple cider vinegar while others used balsamic or champagne. I will undoubtedly try it both hot and cold processed at some point and next time I will combine the fruit and vinegar and leave for a week to see how that turns out. So get your shrub on and let me know how it works out and if you have any great tips! Click here for an interesting shrub recipe and some wisdom on technique. Rhubarb syrup and apple cider vinegar combined in a sterilized jar. Leave to set out for one week.